The name Knocklaur is marked about 1 km E of this peak on the Discovery map. As there is no summit at this point, it is not clear exactly which hill the name applies to. Knocklaur is the 509th highest place in Ireland. Knocklaur is roughly the midpoint on the ridge connecting Maumtrasna and Devilsmother. This explains its name, Knocklaur, meaning ‘middle hill’. There is a steady bog sweeping up to the summit from the south, while to the north of the summit ridge the ground plummets away in sharp cliffs and extremely steep slopes. The views from Knocklaur are fantastic, especially across to the ridge containing Devilsmother and Devilsmother North Top to the west, and the vast bulk of Maumtrasna to the east. 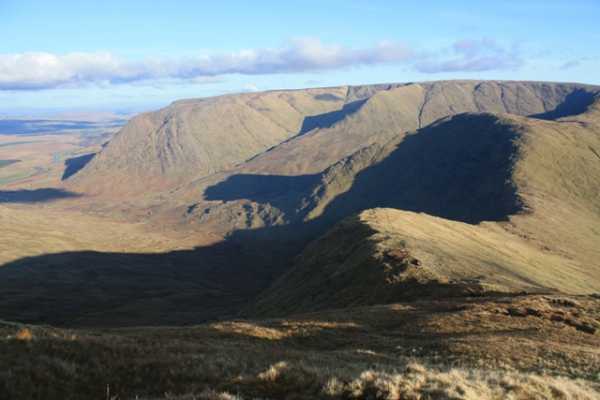 Knocklaur has a large spur that juts out north into the Glennacally valley, although the severity of the gradient on this spur would prevent access to Knocklaur this way for all but the most experienced summiteers.